These oil rubbed bronze register covers are coated in a protective powder coating to prevent tarnishing to the metal floor vent faceplate. 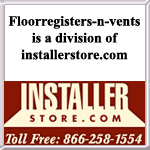 Rockwell metal floor vents drop straight into any floor opening for quick and simple installation. 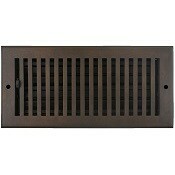 You'll be amazed to know that the oil rubbed bronze register covers aren't just metal floor vents, they can also be used in wall hole openings. Read below for further details. Our metal floor vents are made with a steel damper which will regulate air flow in and out of the room. Also, the oil rubbed bronze register covers are overall made out a steel core construction, with a 3mm thick faceplate for added strength. Tip: A 2" x 14" oil rubbed bronze register cover will fit into a hole opening of 2" x 14". Do not take measurements of old metal floor vents since faceplate dimensions can vary from manufacturer to manufacturer. All of these oil rubbed bronze register covers are suitable only for wall installation when used with our wall mounting brackets. Do not use in ceiling openings. Check out our huge selection of other metal floor vents for a variety of finishes and styles. This warm and inviting oil rubbed bronze register cover is the perfect addition to any room. A color and design you must try in your home today!